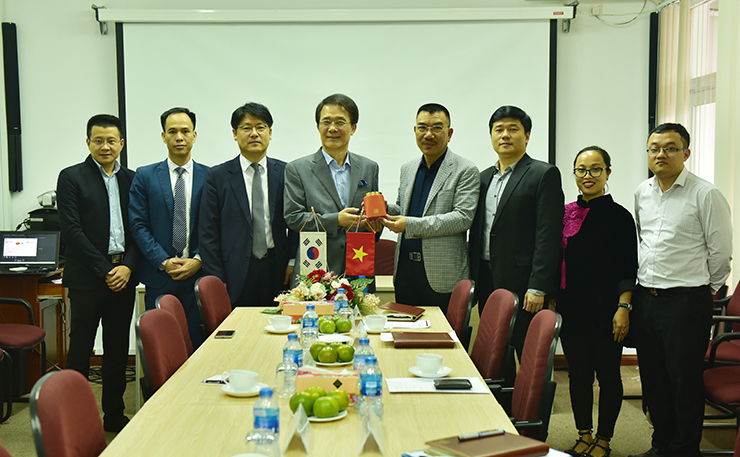 In order to promote extensive cooperation in many fields and market development in Vietnam, South Korea as well as other countries in Asia and around the world, on April 17, 2018, the senior delegation of HanmiGlobal Co., Ltd visited and worked at Consultant and Inspection Joint Stock Company of Construction Technology and Equipment (CONINCO.,JSC). Attending the meeting, regarding HanmiGlobal, there were Mr. Jong Hoon Kim - Chairman and Founder of HanmiGlobal Co., Ltd; Mr. Jae Keuk Shim - General Director of HanmiGlobal Vietnam, Mr. Nguyen Thiet Viet - Vice General Director of HanmiGlobal Vietnam. Welcoming partners, regarding CONINCO, there were Mr. Nguyen Van Cong - Chairman of the BOM, Dr. Ha Minh - General Director, Dr. Nguyen Dac Phuong - Manager of Marketing Department, Ms. Pham Thuy Linh - Deputy Manager of Marketing Department and Dr. Duong Trong Vinh - Director of Center of International Cooperation and Consultancy. At the meeting, Mr. Nguyen Van Cong - Chairman of the BOM, on behalf of the company, gave thanks to Chairman of HanmiGlobal for visiting and working at CONINCO. In recent years, the cooperation between the two countries has a vast development. CONINCO and HanmiGlobal also signed a Memorandum of Understanding and together implemented a number of projects in Vietnam, making the foundation for sustainable cooperation and market development of the both sides. During this business trip of HanmiGlobal, Chairman Nguyen Van Cong expressed his wish that HanmiGlobal President would share his experiences and strategies to together develop the market in the near future, especially in the fields of energy, technology transfer,... to develop human resources meeting the increasingly stringent requirements of the investors. The meeting took place in an open atmosphere. Mr. Jong Hoon Kim thanked the Chairman of the BOM and the leaders of CONINCO for their welcome. Representatives of the two parties hoped that in the coming time, CONINCO and HanmiGlobal would have closer cooperation, actively exchange information and jointly develop and implement market development strategies in various fields in the region and in the world.